Deep inside a mountain crater an angel materializes before three stunned teenagers sending them on a quest to find 20 enchanted crystals. These are no ordinary crystals. Their fractals, once activated, will illuminate the planet and change the world for the better, socially and environmentally. In France, Jesse enters the domain of a terrifying witch and her fanged wolfhound guarding the crystals. In Oregon, Nikki can’t make friends but must gather an ace team to search for an abandoned crystal mine. In New Zealand Chaz must explore sacred Maori caves, but has to convince a fearsome soothsayer, and her zany cave guide, to let him look for crystals. How do Jesse, Nikki and Chaz manage to ditch nosy parents?—overcome being lost?—avoid falling to their death?— evade primeval curses, fierce changelings and supernatural phenomenon? To find out, read The Crystal Chain, an extraordinary exploit filled with daring, magic, mystery and the paranormal. Judi knows how to move a story forward. From Oregon to New Zealand to France, with a cast of unlikely friends and a storyline that is both modern and timeless, she leads the reader toward a skin-tingling climax that gives hope to an evolving new generation. JUDI VALENTINE has been writing youth fiction/ fantasy and crime stories for several years. 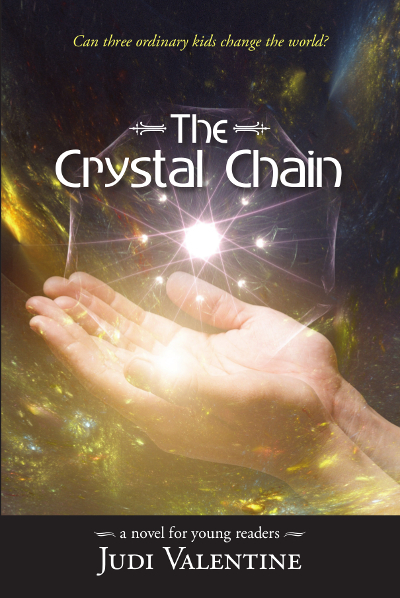 The Crystal Chain is her first published children’s novel. She has had short stories published in regional publications of her home state of Maine, and in 2003, with Two Suns Press, published a workbook on diet and human nutrition which has sold over 5,000 copies.